Call or email directly for the best prices. 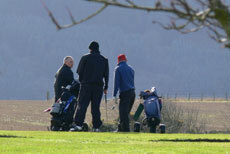 We all know there are a plethora of golf courses to choose from here in Scotland and in particular Perthshire and Gleneagles. 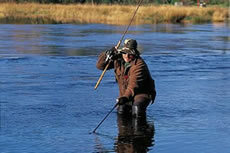 There is superb salmon and trout fishing on the River Tay and the River Earn both close by (permits required). Drummond Fishery and Trout Farm is just west of Comrie. 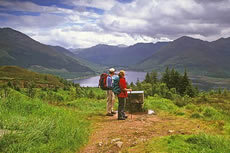 If you are visiting Perthshire for walking then you are spoilt for choice. Whether it is a ramble or a strenuous hill walk, there are numerous to choose from. 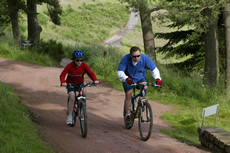 Cycling opportunities are as rich and varied as the landscape with routes to suit all abilities including the keen mountain biker with an abundance of forest tracks, designed specifically for mountain biking in Perthshire. We are located next to one of Auchterarder’s most reputable Health and Beauty Rooms and we can pre-book any treatments you would like while staying with us at Basset Cottage Bed and Breakfast. Zdenko Domančić has created and developed the Zdenko Domančić Method of Bioenergy over the last 25 to 30 years. Master Zdenko Domačić has always wanted to pass the knowledge from the field of his method on. Because our bed and breakfast accommodation is situated in Perthshire, it is an ideal base for touring Perthshire and Scotland. 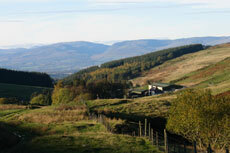 Stirling and Perth are just twenty five minutes away from our bed and breakfast in Perthshire. Call our B&B to book direct today on 07514 258694 or fill in our enquiries form to book your bed and breakfast accommodation. Basset Cottage is a cosy B&B in Auchterarder near Gleneagles in Perthshire, Scotland. Our Bed and Breakfast is the ideal accommodation for your holiday or a short break to go Golfing, Fishing or to visit Central Scotland or Perthshire. Book our B&B direct today! Direct booking secures the best rate. Copyright © 2010 B&B Basset Cottage - All Rights Reserved.